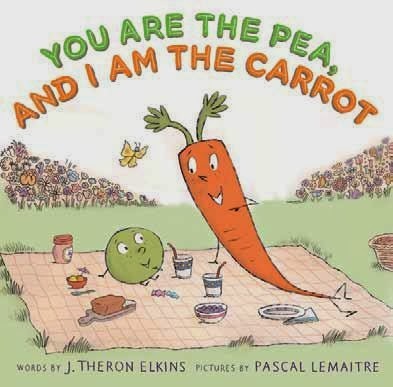 It's these kinds of blissful pairings that are celebrated in You Are the Pea, and I Am the Carrot, as a couple of friends together create the perfect 'recipe' for friendship. Local readers might not be familiar with some of the American terms ('jelly' instead of 'jam', for example), but this doesn't really affect the enjoyment of the food-infused rhyming text and quirkily entertaining illustrations. A match this good is rare. While this is a fun celebration of life-long friendship that kids will enjoy (especially the often laugh-out-loud partnership scenarios! ), it's a book that would also make a whimsically endearing (although potentially hunger-inducing) gift for the one you love.